Published on February 6, 2017 in Equipment & Products, Featured Article and Pacific Builder & Engineer. Closed Tags: Alaska, construction, construction industry, contractors, economy, equipment, Fred Meyer, GPS machine control system, heavy equipment, Palmer, Tesla data collector, The Kroger Co., Topcon, Topcon 3D-MC² dozer system, Topcon HiPer V receiver rover. Palmer, Alaska has just under 6,000 residents, but as a commercial and cultural center for the region it draws visitors from well beyond its city boundaries. Come the end of summer, the annual week-and-a-half long Alaska State Fair, located in Palmer, can draw more than 300,000 visitors. The fairgrounds are located approximately one hour north of Anchorage, which helps explain how Palmer and the fairgrounds can draw such large numbers. An indicator of how Palmer, which was established around a 1930s New Deal farm colony has changed, can be seen in the growth of the Palmer big-box Fred Meyer store. Built about 10 years ago and the smallest in Fred Meyer’s retail network at 66,000 square feet, the Palmer store was built then much to the chagrin of many locals who feared the end of their quaint, small-town community. Fred Meyer is owned by The Kroger Co., one of the nation’s largest grocery retailers. During the years, Palmer residents made peace with its Fred Meyer store. The location is big enough to offer groceries and other items including a little clothing — socks, jeans, and underwear. Recent scuttlebutt was that the store was so successful it was outgrowing its “small” space. With the demolition of a vacant 30-year-old shopping center, the site was readied for the new 100,000 square foot Fred Meyer. The new store is expected to cost $20 million to $30 million to build, and is expecting to add 100 jobs. The big-box builder giant ESI or Engineered Structures Inc., Boise, Idaho, won the contract as general contractor for the Palmer Fred Meyer. ESI concentrates on commercial construction, primarily for major retail outlets such as Fred Meyer, Albertson’s, Wal-Mart, Staples, Home Depot and other big-box stores in all of the Western states. 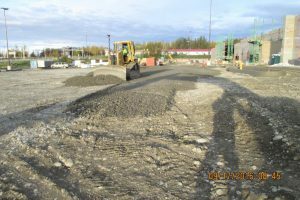 The residential and commercial construction company, Dirtworks, was started in 1989 and has expanded gradually ever since completing projects for individual residents to large, complex municipal and commercial projects. 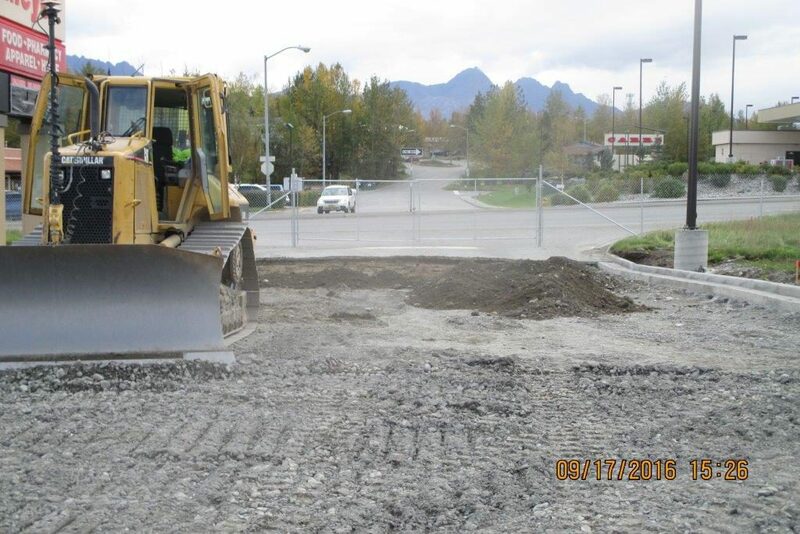 The company has also completed work for the Alaska DOT and Public Facilities. The site had a small commercial building, which housed a grocery store until 2010. That store opted to build a new location across the road too, on the other side of the Glenn Highway where the new Fred Meyer store is being built. Plans call for the new Palmer Fred Meyer to give shoppers more of the full-line amenities found in larger Fred Meyer stores. The store will feature more furniture, apparel and garden supplies, as well as expanded natural food sections. The condition of the 10-acre site was flat with a large, approximately 66,000 cubic yard hill that ran along the back and around the corner. The majority of the jobsite was previously occupied by the grocery store. But in order to fit the new bigger Fred Meyer store the site needed to be bigger. The soil was sandy gravel with big rock and silty brown topsoil type material. 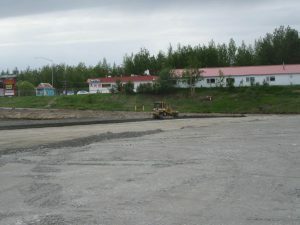 Dirtworks approached the site as a site balance project, utilizing the hill on the back half of the property for fill. 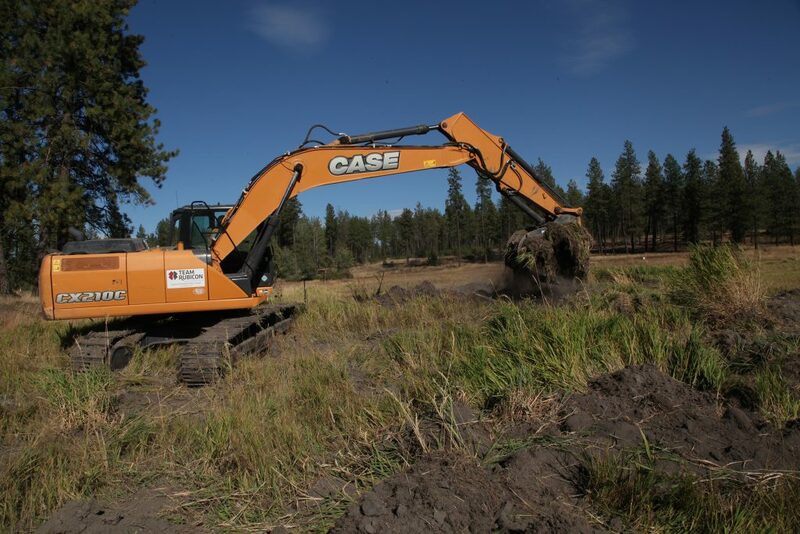 For the project, Dirtworks used three mid-size hydraulic excavators that included a Case CX460, Hitachi ZX350LC-6, and a Hitachi EX200LC-5. They also had a pair of 40-ton rock trucks, a Cat D-5K dozer equipped with Topcon 3D-MC² GPS machine control system. They also used a combo Topcon HiPer V receiver rover and base station and a hand-held or rod mounted Tesla data collector. There were no early completion incentives, but there were penalties for the general contractor if milestones were not met. The Topcon 3D-MC² dozer system is designed to achieve finish grade with the machine traveling at a faster speed. Traditional finish grading with a dozer generally will take multiple passes at slower speeds. For Dirtworks the use of machine control and site positioning technology is new to them. Dirtworks currently owns four HiPer V base-rover combos, two Tesla data collectors, and a dual 3D-MC² dozer system. The Topcon HiPer V base-rover combo is considered an all-on-the-pole GNSS receiver that can use 226 channels to lock in a satellite signal. Smaller than a tablet computer, the palm-size, touch-screen Tesla data collector is designed to be flexible. It can be hand-held to provide a vertical screen orientation or affixed to the GNSS receiver rod to provide a horizontal-screen orientation. 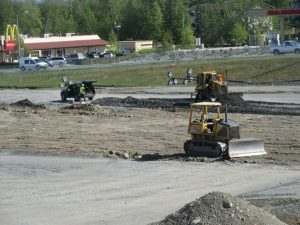 For the Palmer Fred Meyer project, Dirtworks used a HiPer V base-rover combo, a Tesla data collector, and the GPS grade control system on its dozer. The Topcon systems were used throughout the entire project to control the production. “The thing that is so nice when using technology is that even on a site this big with a good map and model we can hand the data collector to anyone on the crew and get usable information,” Johnson explained. “We bid the project to be a site balance, using onsite materials to bring the site up to grade by removing the material from the back of the property and spreading over the remainder of the site. 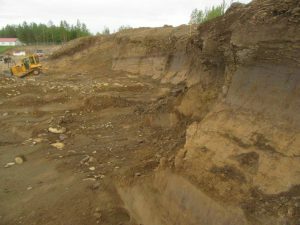 “Our figures were based on the provided geo-technical report which provided a bore log in the top, tallest and fattest part of the hill, showing gravel from top to bottom. Only problem… as it turned out, where they punched the bore log happened to be the only area where there was usable gravel. Just beyond this bore log, the gravel disappeared and became unusable silty material. This meant that the project went from a quick excavator and rock-truck show to a highway truck job. The silty unusable material had to be hauled away and better usable material needed to be imported. It is always quicker to move material onsite with rock trucks than it is to use highway trucks. 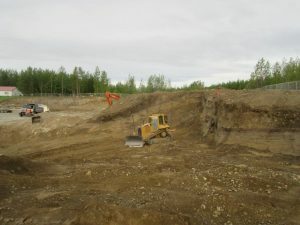 So, we needed to make sure we were always able to run the maximum amount of highway trucks that the loader at the off-site pit could handle, along with the help of our excavator loading trucks off site. For Dirtworks, the adoption of machine control and site positioning technology appears to be changing how they approach their market. Published on November 4, 2016 in Daily Dirt, Industry Activities, National and Pacific Builder & Engineer. 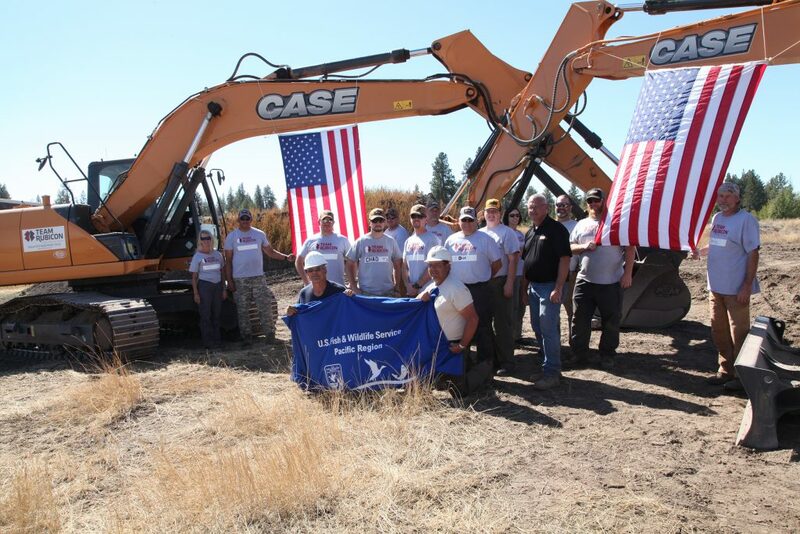 Closed Tags: Case, Case Construction, Case Construction Equipment, Central Machinery, construction, construction industry, contractors, Team RUBICON, Turnbull Wildlife Refuge. 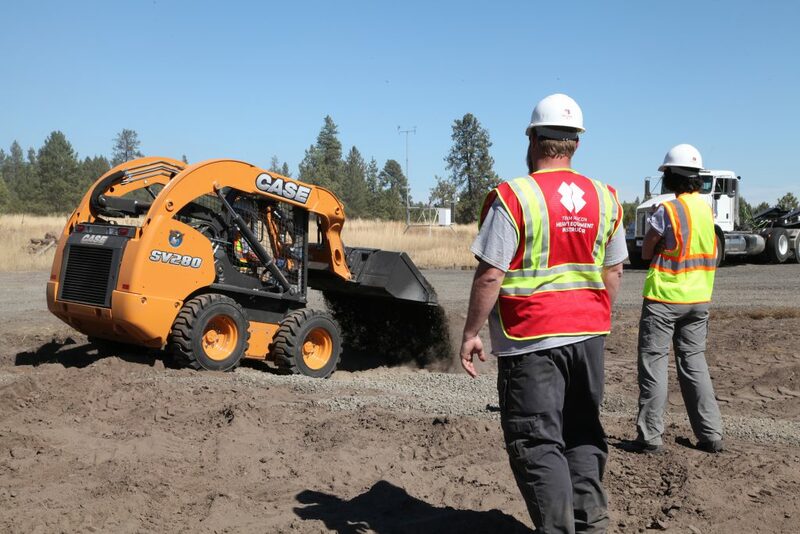 Team Rubicon used the exercise to train its members in the safe use and maintenance of heavy equipment for its disaster response operations. Central Machinery provided CASE CX130D and C210C heavy excavators, along with an SV280 skid steer, for the training and project work. Published on August 10, 2016 in California Builder & Engineer, Construction, Construction Digest, Construction News, Constructioneer, Daily Dirt, Dixie Contractor, Michigan Contractor & Builder, Midwest Contractor, National, New England Construction, Pacific Builder & Engineer, Rocky Mountain Construction, Texas Contractor and Western Builder. Closed Tags: ACP, AED, Associated Construction Publications, Associated Equipment Distributors (AED), Case, Cat, Caterpillar, construction, construction industry, contractors. James Joseph Elliott passed away August 4, 2016 at the age of 94. James was born in Hastings, Nebraska, the youngest of seven children born to Joe and Anna Elliott. He enlisted in the United States Marine Corp with the 7th Regiment 1st Division while attending Hastings College. James was in the landing invasion of Okinawa and active in combat with the Japanese for the 86 day fight to secure the island. He then served in China for 9 months and was honorably discharged in 1946. James married Leitha Seberg and they shared 27 years together. After the passing of Leitha, he later married Jeannie Markert and they resided in Visalia for 28 years. Jeannie passed away on January 10, 2007. He leaves behind his companion of ten years, Betty Peters of Visalia. James is also survived by his children, Anne Hickman and Gregory Elliott and wife Mary, all of Bonanza, Oregon. James leaves the Elliott grandchildren, Teri Torres and husband, George Torres and Daniel Hickman and wife, Pamela; three great grandchildren Austin Torres, Hunter and Bryce Hickman. James was preceded in death by his son-in-law, Jeffrey Hickman and granddaughter Leanna Torres. He was a member of Grace Lutheran Church of Visalia for 27 years where he served as an usher for many years. James’ greatest love was for the Lord. He was a very spiritual man. He was a member of Avenue of the Flag, Veterans of Foreign Wars and American Legion. James volunteered at Kaweah Delta District Hospital as a Blue Boy and was a member of Lifestyle Center for 18 years. 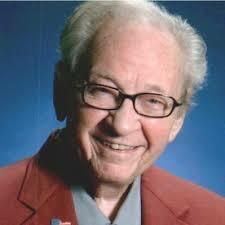 James worked as an advertising/public relations executive for over 60 years. Baseball was his passion. Our Dad had a great sense of humor; loved his family and loved life. Memorial services will be held on Wednesday, August 10, 2016 at 11:30 a.m. at Grace Lutheran Church, 1111 S. Conyer Street in Visalia. Remembrances may be made to Grace Lutheran Project “The Next 100 Years” or Avenue of the Flag, PO Box 1261, Visalia, CA. Tributes and condolences may be made at www.millerchapel.com. Arrangements entrusted to Miller Memorial Chapel, 1120 W. Goshen Ave., Visalia, CA (559) 732-8371. Jim will be missed and remembered by his numerous friends in the construction industry where he plied his skills as an advertising and public relations executive for the Associated Construction Publications (ACP) from 1972 to 1990. Jim was ACP’s Western Regional representative responsible for all 14 ACP magazines (California Builder & Engineer, Construction, Construction Bulletin [no loner with the ACP magazines],Construction Digest, Construction News, Constructioneer, Dixie Contractor, Michigan Contractor & Builder, Midwest Contractor, New England Construction, Pacific Builder & Engineer, Rocky Mountain Construction, Texas Contractor, Western Builder) – a big territory, from Oregon to the Dakotas all the way to Texas. After leaving the ACPs Jim was an independent rep for several publications including the Associated Equipment Distributors (AED) association magazine. Jim really was an industry icon. Published on April 21, 2015 in Daily Dirt, National and Pacific Builder & Engineer. Closed Tags: asphalt, concrete, construction, construction industry, contractors, economy, employment, equipment, Federal Highway Administration (FHWA), Federal Highway Trust Fund, gas tax, heavy equipment, Highway Bill, highways, infrastructure, Interstate Highway System, jobs, National Highway Traffic Safety Administration (NHTSA), pavement, roads, safety, the American Association of State Highway and Transportation Officials (AASHTO), The Bureau of Transportation Statistics (BTS), the Texas Transportation Institute (TTI), the U.S. Census Bureau, transportation, TRIP, Washington State Department of Transportation (WSDOT). Washington’s transportation system faces mounting challenges in the form of deteriorated roads and bridges, increasingly congested and crowded highways and transit systems, a need for additional roadway safety improvements, and a lack of funding to proceed with numerous needed transportation improvements, threatening the state’s quality of life and economic vitality. Increased investment in transportation improvements at the local, state and federal levels could improve road and bridge conditions, boost safety, increase roadway efficiency and support long-term economic growth in Washington, according to a new report released today by TRIP, a Washington, DC based national transportation organization. According to the TRIP report, “Washington’s Top Transportation Challenges: Meeting the State’s Need for Safe and Efficient Mobility and Economic Vitality,” approximately one-third of the state’s locally and state-maintained urban pavements and more than one-fifth of major locally and state-maintained rural pavements are in poor condition. Over the next decade, the Washington State Department of Transportation (WSDOT) faces a $1.8 billion backlog in funds needed for pavement preservation. Because of the lack of funding, the share of state-maintained roads in need of resurfacing or reconstruction is projected to quadruple by 2025. Driving on rough roads costs Washington motorists a total of $2.9 billion each year in the form of extra vehicle operating costs – $551 annually per driver. These costs include accelerated vehicle depreciation, additional repair costs, and increased fuel consumption and tire wear. Washington’s bridges are also increasingly deteriorated. Five percent of Washington’s locally and state-maintained bridges are structurally deficient, meaning they have significant deterioration of the bridge deck, supports or other major components. These bridges are often posted for lower weights or closed to traffic restricting or redirecting large vehicles, including commercial trucks and emergency response vehicles. An additional 21 percent of Washington’s locally and state-maintained bridges are functionally obsolete. Bridges that are functionally obsolete no longer meet current design standards, often because of narrow lanes, inadequate clearances or poor alignment. According to WSDOT, 110 state-maintained bridges that are currently rated in poor condition are expected to remain in poor condition through 2020, due to a lack of funding. WSDOT also projects that 41 state-maintained bridges currently rated in fair or good condition, are expected to deteriorate to poor condition by 2020 due to a lack of funding. The list below details state-maintained bridges in the Puget Sound area that are currently structurally deficient. A list of structurally deficient bridges throughout Washington can be found in Appendix A of the report. Congestion on the state’s roadways and ridership on the transit network are increasing, particularly in the Puget Sound area, where nearly 98 percent of delay hours occur. Congestion-related delays cost Washington’s drivers and businesses $858 million annually. The TRIP report identifies the 15 most congested commuting routes in the state, which include the following. “The new TRIP data underscores what we already knew. Washington’s transportation system is fragile and deteriorating. It is past time for state lawmakers to take action on a bipartisan transportation investment package that will take better care of existing roads and bridges and improve key economic corridors,” said Steve Mullin, president of the Washington Roundtable. Without a significant boost in transportation funding at the local, state and federal level, the condition and efficiency of Washington’s surface transportation system will decline. Many needed transportation improvements may not be completed without additional funds. The TRIP report identifies the following needed transportation projects throughout the state that are unable to move forward without additional funding. “Poor roads and bridges are wasting time and strangling our economy. We need a transportation package that enhances mobility and safety and improves critical corridors like Highways 167 and 509 and many others across the state,” said Tom Pierson, president and CEO of the Tacoma-Pierce County Chamber of Commerce. Traffic crashes in Washington claimed the lives of 2,280 people between 2009 and 2013, an average of 456 fatalities each year. The state’s overall traffic fatality rate of 0.76 fatalities per 100 million vehicle miles of travel is lower than the national average of 1.09. Washington’s rural non-Interstate roads have significantly higher rates of fatal crashes, with a traffic fatality rate of 1.76 fatalities per 100 million vehicle miles of travel, nearly three-and-a-half times the 0.52 fatality rate on all other roads and highways in the state. The efficiency and condition of Washington’s transportation system, particularly its highways, is critical to the health of the state’s economy. In 2012, $181 billion in goods was shipped from sites in Washington to sites outside the state, $169 billion worth of goods was shipped into the state and $253 billion of freight was shipped within the state, mostly by truck. Fifty-eight percent of the goods shipped annually in Washington are carried by trucks and another 20 percent are carried by courier services or multiple mode deliveries, which include trucking. “Our state is growing – people want to live, work and make this a better place – but the state transportation system is holding them back. Washington needs to invest in more efficient road and bridge networks, provide transit options and improve mobility and safety,” said Maud Daudon, president and CEO of the Seattle Metropolitan Chamber of Commerce. Washington’s extensive transportation system provides the state’s residents, visitors and businesses with a high level of mobility, while acting as the backbone that supports the state’s economy. Washington’s transportation system enables the state’s residents and visitors to travel to work and school, visit family and friends, and frequent tourist and recreation attractions while providing businesses with reliable access to customers, materials, suppliers and employees. However, the state faces numerous challenges in providing a transportation system that is safe, well-maintained, efficient and adequately funded. As Washington works to retain its quality of life, maintain its level of economic competitiveness and achieve further economic growth, the state will need to preserve, maintain and modernize its roads, highways, bridges, transit, bike and pedestrian facilities by improving the physical condition of its transportation network and enhancing the system’s ability to provide efficient and reliable mobility for its residents, visitors and businesses. Making needed improvements to Washington’s transportation network could also provide a significant boost to the state’s economy by creating jobs in the short term and stimulating long term economic growth as a result of enhanced mobility and access. Washington must maintain and improve its transportation system to foster economic growth and to support businesses in the state. In addition to economic growth, transportation improvements are needed to ensure safe, reliable mobility and a high quality of life for all residents. Meeting Washington’s need to modernize and maintain its system of roads, highways, bridges and transit will require significant local, state and federal funding. Approximately one third of Washington’s locally and state-maintained urban pavements and more than one-fifth of locally and state-maintained rural pavements are in poor condition. Pavement conditions are projected to deteriorate further in the future, as the state anticipates a $1.8 billion backlog over the next 10 years in funds needed for pavement preservation. Deteriorated pavement conditions provide a rough ride and cost motorists in the form of additional vehicle operating costs. Thirty-four percent of Washington’s major urban locally and state-maintained roads are in poor condition, while an additional 42 percent of the state’s major urban roads are in mediocre or fair condition. The remaining 24 percent are in good condition. Twenty-two percent of the state’s major rural locally and state-maintained roads are in poor condition. An additional 52 percent of rural roads are in mediocre or fair condition and the remaining 26 percent are in good condition. Over the next decade, the Washington State Department of Transportation (WSDOT) estimates a need of $2.8 billion for pavement preservation. However, only $1 billion will be available, leaving a backlog of $1.8 billion over the next decade. According to WSDOT, 10 percent of state-maintained roads are currently in need of resurfacing or reconstruction. Because of a lack of funding, that number is anticipated to more than quadruple by 2025, to 41 percent of state-maintained roads in need of resurfacing or reconstruction, if available state pavement preservation funding is evenly distributed by lane miles and vehicle miles traveled. Driving on rough roads costs Washington motorists a total of $2.9 billion annually in extra vehicle operating costs (VOC) –$551 annually per driver. Costs include accelerated vehicle depreciation, additional repair costs, and increased fuel consumption and tire wear. Approximately one-quarter of locally and state-maintained bridges (20 feet or longer) in Washington show significant deterioration or do not meet current design standards often because of narrow lanes, inadequate clearances or poor alignment. Five percent of Washington’s locally and state-maintained bridges are structurally deficient. A bridge is structurally deficient if there is significant deterioration of the bridge deck, supports or other major components. Structurally deficient bridges are often posted for lower weight or closed to traffic, restricting or redirecting large vehicles, including commercial trucks and emergency services vehicles. Twenty-one percent of Washington’s locally and state-maintained bridges are functionally obsolete. Bridges that are functionally obsolete no longer meet current highway design standards, often because of narrow lanes, inadequate clearances or poor alignment. According to WSDOT, 110 state-maintained bridges that are currently rated in poor condition are expected to remain in poor condition through 2020, due to a lack of funding. WSDOT also projects that 41 state-maintained bridges currently rated in fair or good condition, are expected to deteriorate to poor condition by 2020 due to a lack of funding. The overall number or state-maintained bridges rated poor in Washington is expected to increase from 137 currently to 176 in 2020, according to WSDOT. 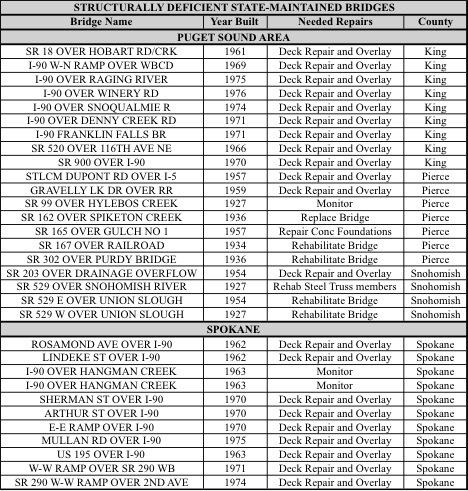 The list below details state-maintained bridges in the Puget Sound and Spokane areas that are currently rated in poor condition. A full list of state-maintained bridges rated in poor condition throughout Washington can be found in Appendix A. By 2020, WSDOT reports that 41 state-maintained bridges, which are currently in fair or good condition, will deteriorate to poor condition, based on current funding. 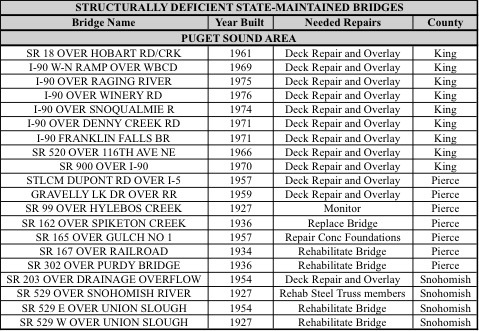 The list below details state-maintained bridges in the Puget Sound area that currently are in good or fair condition, but are projected to decline to poor condition in 2020 due to a lack of sufficient funding. A list of all 41 state-maintained bridges throughout Washington that are currently in good or fair condition but are projected to decline to poor condition by 2020 can be found in Appendix B. TRANSPORTATION CHALLENGE: Increasingly Congested Roadways Increasing levels of traffic congestion cause significant delays in Washington, particularly in the state’s larger urban areas, choking commuting and commerce. Traffic congestion robs commuters of time and money and imposes increased costs on businesses, shippers and manufacturers, which are often passed along to the consumer. Congestion on the state’s roadways and ridership on the state’s public transit systems is increasing, particularly in the Puget Sound area, where nearly 98 percent of delay hours occur. Congestion-related delays on state highways cost drivers and businesses $858 million in 2013, approximately $125 per Washingtonian. Several major commuting corridors in the Puget Sound area have experienced significant increases in delay hours between 2011 and 2013, including I-5, I-90, SR 167 and I-405. 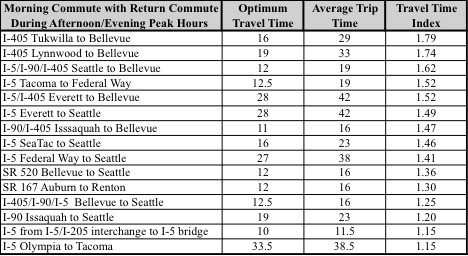 The chart below details TRIP’s analysis and ranking of the 15 most congested commuting routes in the state, based on WSDOT’s 2014 Corridor Capacity Report. This analysis includes a morning trip during peak hours originating from the initial location and a reverse trip in the evening on the same route. It is weighted to include average time for trips on Single Occupancy Vehicle (SOV) lanes, High Occupancy Vehicle (HOV) and High Occupancy Toll (HOT) lanes and is ranked by the level of delay on each route, as measured by the additional time it takes to complete the trip during peak hours. The optimum trip time listed below indicates the length of the commute in minutes when all vehicles are traveling at the most efficient speed to maximize vehicle throughput. The Travel Time Index (TTI) for the route indicates the amount of extra time required to make each trip, with a baseline score of “1” meaning traffic is moving at optimum speeds to maximize throughput. A TTI score of 1.79 indicates that the average trip time is 79 percent greater than if traffic was moving at an optimum speed. The number of transit trips in the state has increased steadily since 2009. The chart below details the five busiest transit routes in the state (including bus or rail service), as measured by the share of seats that are occupied during peak travel periods. Improving safety features on Washington’s roads and highways would likely result in a decrease in traffic fatalities and serious crashes. It is estimated that roadway features are likely a contributing factor in approximately one-third of all fatal and serious traffic crashes. Between 2009 and 2013 a total of 2,280 people were killed in traffic crashes in Washington, an average of 456 fatalities per year. Washington’s overall traffic fatality rate of 0.76 fatalities per 100 million vehicle miles of travel in 2013 is lower than the national traffic fatality rate of 1.09. The fatality rate on Washington’s rural non-Interstate roads was 1.76 fatalities per 100 million vehicle miles of travel in 2013, nearly three and a half times higher than the 0.52 fatality rate on all other roads and highways in the state. Roadway features that impact safety include the number of lanes, lane widths, lighting and adaptive lighting systems, lane markings, rumble strips, shoulders, guard rails, break away and other protective devices, median barriers, roundabouts, and other intersection designs. The cost of serious crashes includes lost productivity, lost earnings, medical costs, lawsuits, insurance cost and emergency services. Several factors are associated with vehicle crashes that result in fatalities, including human factors, driver behavior, vehicle characteristics and roadway features. TRIP estimates that roadway features are likely a contributing factor in approximately one-third of fatal traffic crashes. Where appropriate, highway improvements can reduce traffic fatalities, serious injuries and crash occurrence while improving traffic flow to help relieve congestion. Such improvements include removing, relocating or shielding obstacles; adding or improving medians; improved and adaptive lighting systems; variable speed limits and dynamic warning devices; adding rumble strips, wider lanes, wider and paved shoulders; upgrading roads from two lanes to four lanes; better road markings, roundabout and traffic signals; and facilities that provide for the integration of the various transportation modes. The efficiency of Washington’s transportation system, particularly its highways, is critical to the health of the state’s economy. Increased deterioration of Washington’s roads and bridges and the lack of needed transportation improvements to serve economic development threaten the state’s economic vitality. New research from Oregon indicates that the cost of making needed road, highway, and bridge improvements is far less than the potential loss in state economic activity caused by a lack of adequate road, highway and bridge preservation. Washington’s key economic sectors — manufacturing, tourism, agriculture, and technology — are highly reliant on an efficient and well-maintained transportation system. Washington’s population reached approximately 7.1 million in 2013, a 45 percent increase since 1990. Washington had 5,301,630 licensed drivers in 2013. Vehicle miles traveled (VMT) in Washington increased by 28 percent from 1990 to 2013 – from 44.7 billion VMT in 1990 to 57.2 billion VMT in 2013. From 1990 to 2013, Washington’s gross domestic product, a measure of the state’s economic output, increased by 98 percent, when adjusted for inflation, above the national average of 65 percent. In 2012, $181 billion in goods was shipped from sites in Washington to sites outside the state, $169 billion worth of goods was shipped into the state and $253 billion of freight was shipped within the state, mostly by truck. Fifty-eight percent of the goods shipped annually in Washington are carried by trucks and another 20 percent are carried by courier services or multiple mode deliveries, which include trucking. A 2014 report by the Oregon Department of Transportation (ODOT) concluded that allowing its state’s major roads, highways and bridges to deteriorate would result in significant reduction in job growth and reduced state gross domestic product (GDP) as a result of reduced economic efficiency. Without a significant boost in transportation funding at the local, state and federal level, the condition and efficiency of Washington’s surface transportation system will decline. Many needed transportation improvements may not be completed without additional funds. A recent national report found that improved access as a result of capacity expansions provides numerous regional economic benefits. Numerous needed transportation projects, listed below by geographic area, are unable to move forward due to inadequate transportation funding at the local, state and federal levels. The list of projects is based on WSDOT’s list of priority projects that are currently unfunded. SR 520 Corridor Improvements: This $1.4-1.57 billion project would complete corridor improvements between I-5 and the West High Rise to address the congestion and safety needs of the corridor. Widening I-405 from Renton to Lynnwood: This $1.1-1.3 billion project would continue the widening of the I-405 corridor between Renton and Bellevue, including the implementation of Express Toll Lanes and rebuilding interchanges. This project would also build the first segment of the I-405/SR 167 Interchange by constructing a direct connector on northbound and southbound lanes between SR 167 HOT and I-405 express toll lanes. This project would complete a 40 mile corridor-wide express toll facility. Mobility Improvements on I-5 from Tacoma to Everett: This $500 million – $1 billion project includes construction of an additional northbound I-5 lane past Seneca Street, integration of traffic management & modal systems, part-time transit bus shoulder lanes and other similar treatments throughout the corridor. Long range improvements could include new express toll lanes to improve HOV lane performance, lower-cost extensions of HOV or express toll lanes between Tacoma and Lakewood, an always-southbound lane in the I-5 reversible roadway, and the full range of operational, demand management, freight and transit enhancements needed to gain full utilization of the existing roadway. SR 520 Bellevue-Redmond Corridor Improvements: This $350-460 million project would construct improvements at the 148th Avenue NE Interchange and reconstruct the 124th Avenue NE Interchange to a full diamond interchange, reducing congestion and improving access to Bellevue and Redmond off the SR 520 corridor. I-90 Seattle to Issaquah Congestion Relief: This $193-250 project would implement tolling on the I-90 floating bridge, convert the HOV lane to an Express Toll Lane east of I-405, and restripe the roadway to allow for EB and WB shoulder use during peak periods between Eastgate and West Lake Sammamish Parkway and Sunset Way. SR 522 Widening from Kenmore to Monroe: This $170-225 million project would complete the widening of SR 522 between Woodinville and Monroe by adding a lane in each direction between Paradise Lake Road and the Snohomish River. It would also construct a new interchange at Paradise Lake Rd. I-5 JBLM Corridor Congestion Mitigation: This corridor experiences delays and heavy congestion during peak hours. This $250-450 million project would increase capacity on I-5 in the Joint Base Lewis-McChord corridor by adding one lane in each direction between Thorne Lane Interchange and the Steilacoom-DuPont Interchange, replacing the Thorne Lane, Berkeley Street and Steilacoom-DuPont Interchanges. The project also includes construction of the Gravelly Lake Drive to Thorne Connector to improve local access, along with bicycle and pedestrian facilities. Construct New SR 167 Freeway: The existing SR 167 route is insufficient to carry existing levels of traffic, leading to unreliable travel times in the Pierce County area and limiting freight movement from the Port to the Green River Valley. This $790-955 million project would construct a new alignment between SR 509 in Tacoma and SR 512 in Puyallup, including a new interchange at I-5, two lanes in each direction between I-5 and Valley Avenue, and one lane in each direction between Valley Avenue and SR 512. 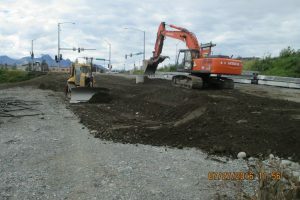 Construction of new SR 509 Freeway: This $758-960 million project would connect SR 509 south from SeaTac to I-5; including one lane in each direction between S 188th and S 24th/28th Avenue, two lanes in each direction between S24th/28th Avenue and I-5, interchanges at S 188th and S 24th, and improvements on I-5 in the vicinity of SR 516 to accommodate the SR 509 with connections to I-5 and local routes. These improvements would allow for improved freight movement south from SeaTac while providing an additional north-south corridor to alleviate heavy demands on I-5. US 395 North Spokane Corridor Completion: This $750-980 project would complete the US 395 North corridor from Francis Avenue to I-90. It would also complete the connection with I-90 to further alleviate congestion in the area. SR 902/Geiger Boulevard Improvements: This $18-23 million project would construct roundabouts at ramp terminals and the SR 902/Geiger Boulevard intersection to improve traffic flow on the interchange. It would also modernize all ramps and widen the existing bridge over I-90 from two to four lanes. I-82 West Richland/Red Mountain Interchange Improvements: This $3-4 million project would construct a roundabout at the SR 224/SR 225 and I-82 ramp terminals. I 5 Mill Plain Boulevard Interchange: This $80-104 million project provides interchange upgrades for vehicle and truck freight access through this heavily urban area. SR 14 Vancouver Corridor Expansion: This $60-79 million project would construct auxiliary lanes between I-205 and 164th Avenue, including improvements at the I-205NB/SR 14 Interchange. It would also construct the West Camas Slough Bridge. These improvements would make this congested route operate more efficiently. I-90 Snoqualmie Pass Widening and Reconstruction: This $130-170 million project would widen an additional two-mile section of the roadway, including reconstruction of the Stampede Pass and Cabin Creek Interchanges to eliminate the existing low clearance. This major freight and recreational corridor experiences frequent congestion during peak travel times and the existing concrete is in need of replacement. US 2 Safety Enhancements: This $15-20 million project provides safety enhancements on US 2 between Snohomish and Skykomish. I-5 and 179th Street Interchange Reconstruction: This $60-79 million project reconstructs the existing interchange and adjacent roadways to allow for improved movements between I-5 and 179th Street in Vancouver. I-5 Slater Road Interchange in Ferndale: This $10-13 million project would improve this congested interchange, which is being strained by heavy commercial development nearby. A recent national report found that improved access as a result of capacity expansions provides numerous regional economic benefits. Those benefits include higher employment rates, higher land value, additional tax revenue, increased intensity of economic activity and additional construction as a result of the intensified use. The 2012 report, “Interactions Between Transportation Capacity, Economic Systems and Land Use,” prepared by the Strategic Highway Research Program for the Transportation Research Board, reviewed 100 projects, costing a minimum of $10 million, which expanded transportation capacity either to relieve congestion or enhance access. The expanded capacity provided by the projects resulted in improved access, which resulted in reduced travel-related costs, faster and more reliable travel, greater travel speeds, improved reliability and increased travel volume.